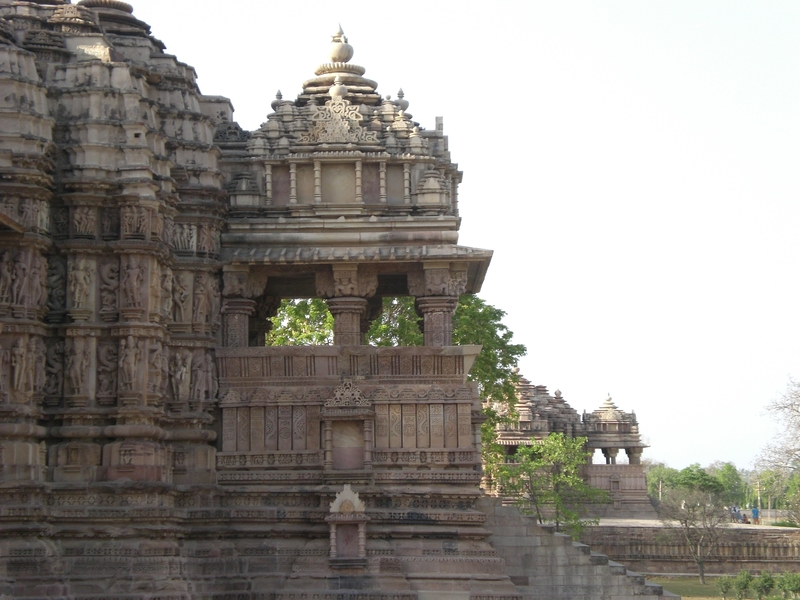 As our plane descended into Khajuraho, it felt like we were headed into the wilderness. All I could see from the window was dirt and bushes and more dirt. No buildings or people in sight, which was in stark contrast to the rest of places we had visited in India. A tiny airport welcomed us to this tiny town. We drove a short distance to the Taj Hotel Chandela, our home for one night. 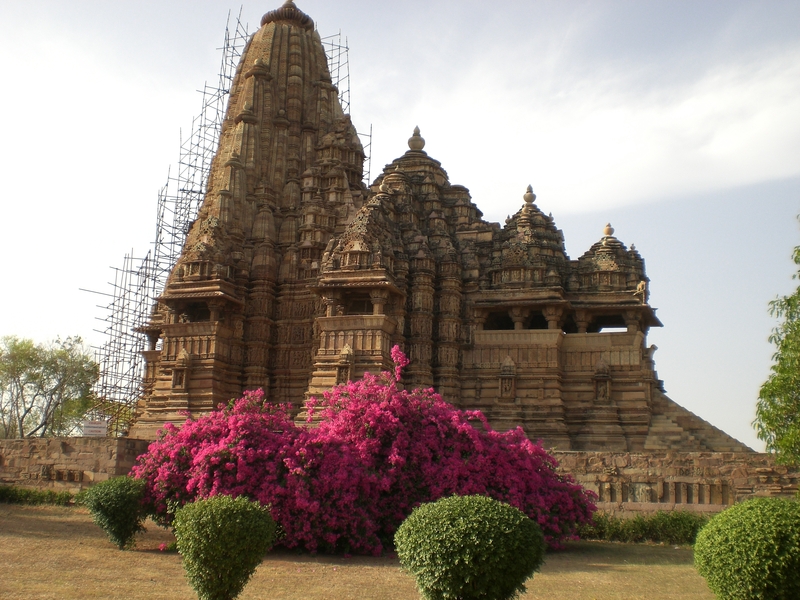 Once we settled in, we were off to visit the temples, as this was a one night stop on our whirlwind trip through Northern India. 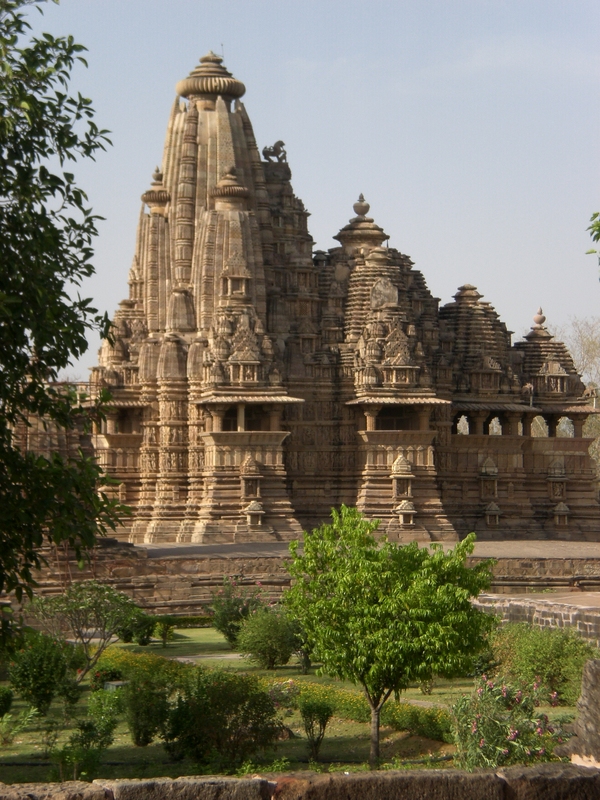 We wanted to visit these temples in particular because they seemed different from many others in India. 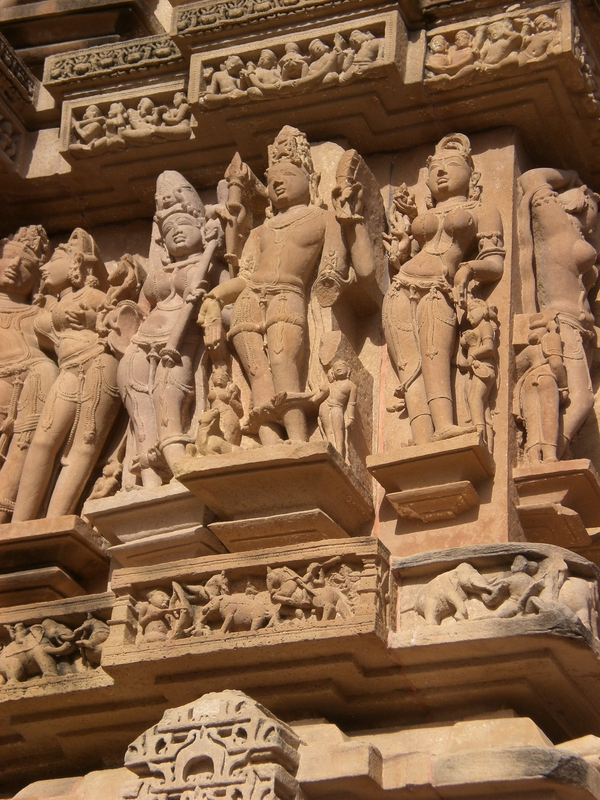 They are sold to tourists as the Kama Sutra temples but not until you see them in person do you realize they are so much more than that. They really are a testament to the female form, goddesses and love. 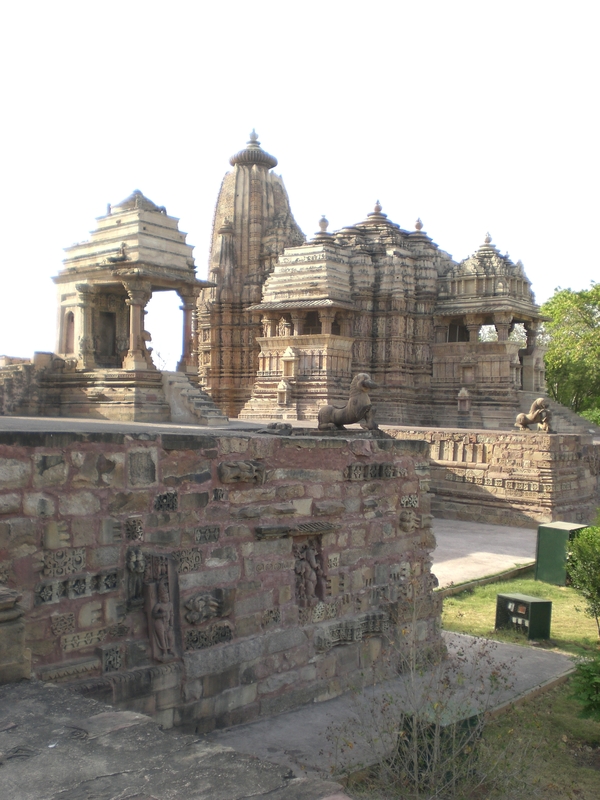 Built in the 9th and 10th centuries, they are in amazing condition. They were buried for hundreds of years, protected by jungle growth and were unearthed only in 1838. 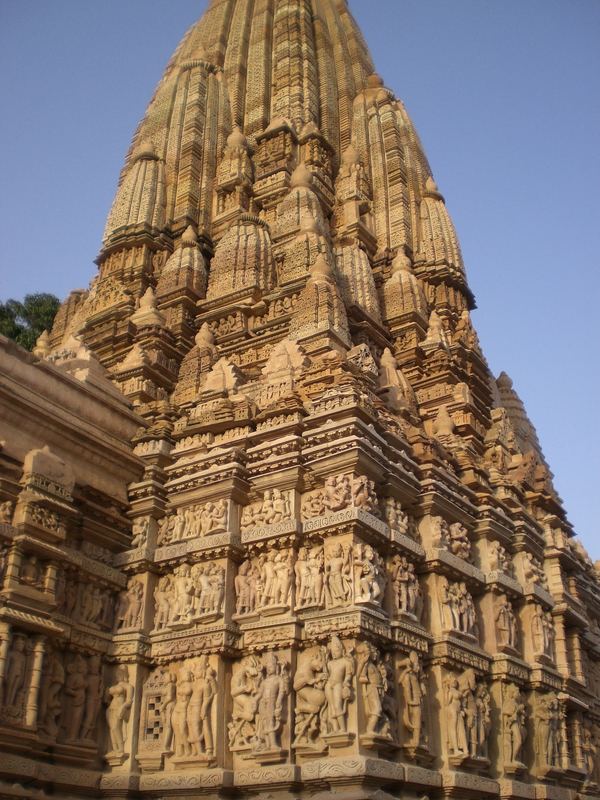 They are a collection of 25 different temples, ranging in size and decoration and are an official UNESCO World Heritage Site. 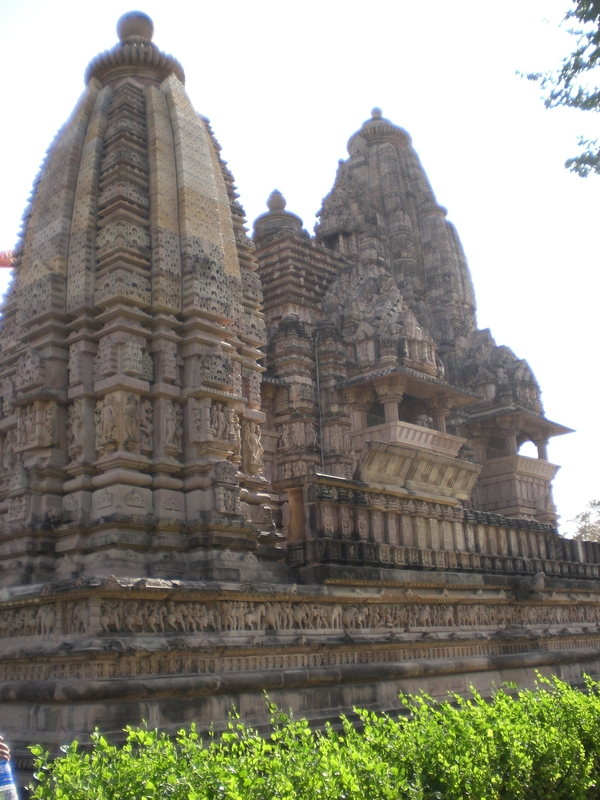 I have to say visiting this town and these temples was a beautiful reprieve from the crowded, hectic pace of other Indian cities. 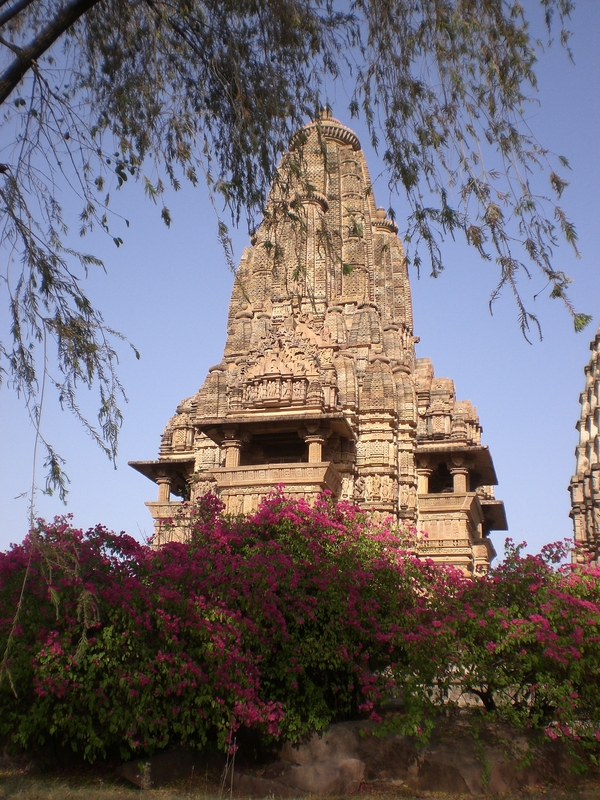 We had the temples virtually to ourselves, surrounded by tranquil gardens and billowing bougainvillea. Don’t get me wrong it was very hot, visiting in April, but we enjoyed popsicles from a local vendor and took shade in the cool stone entrances of the temples. 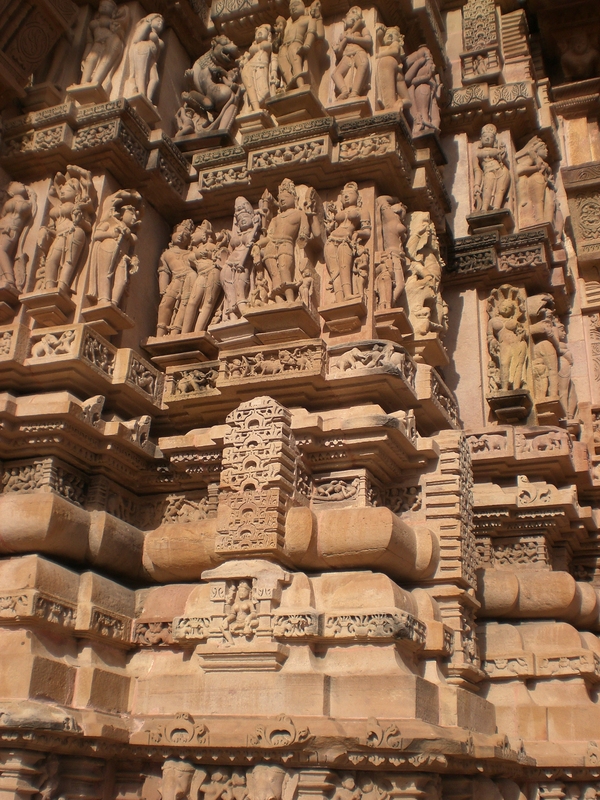 There are more than 800 carved gods,warriors, animals, sensuous maidens and lovers decorating the exterior of the temples. They depict and celebrate life and creation through the union of love. 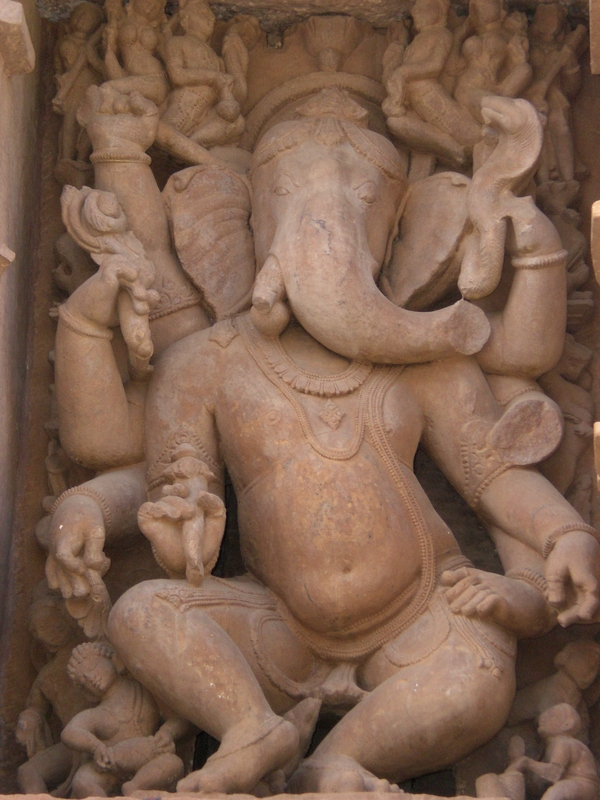 The carvings are stunningly detailed, when you consider they are made of stone. 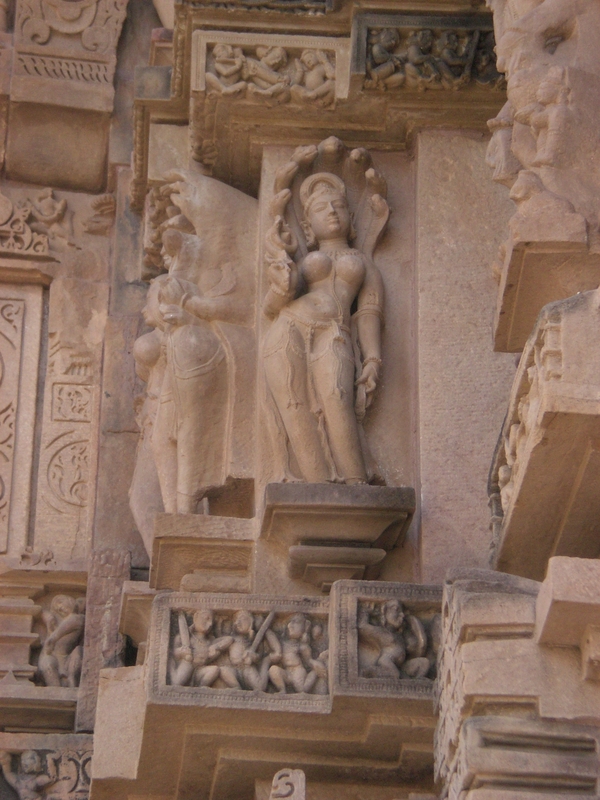 Beautifully rounded female forms grace many parts of the temples and intricate multi-leveled spires are meant to look like mountain ranges. They are beautiful and impressive. 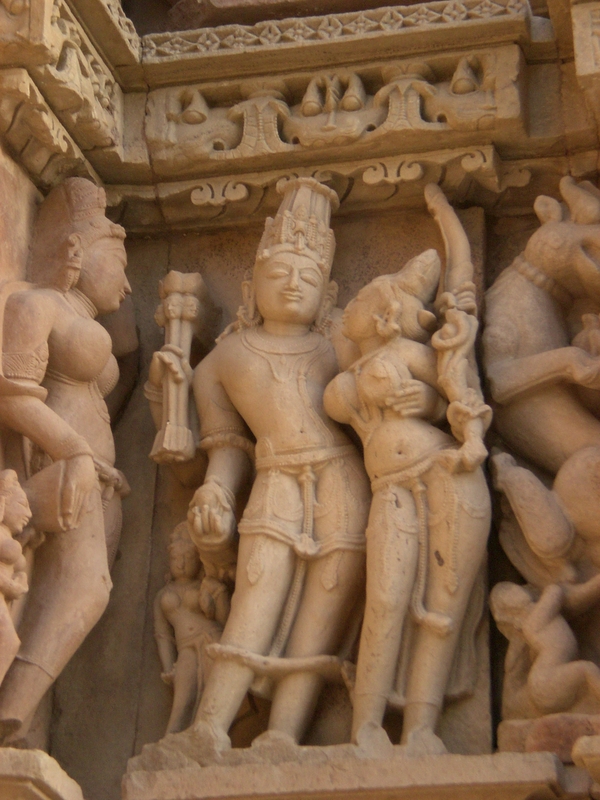 There are some romantic encounters depicted on the temple carvings as well some very explicit ones. 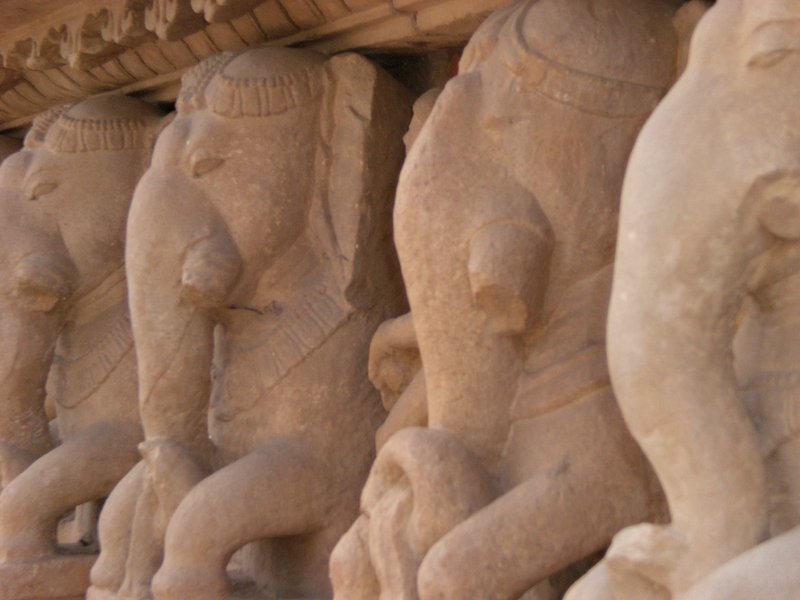 One has to respect the time, effort and detail that went in to creating these elaborate temples. I left with an appreciation for the tranquility of this place on earth and it’s ode to love, in all forms. It was especially wonderful to experience it, in the presence of my true love. 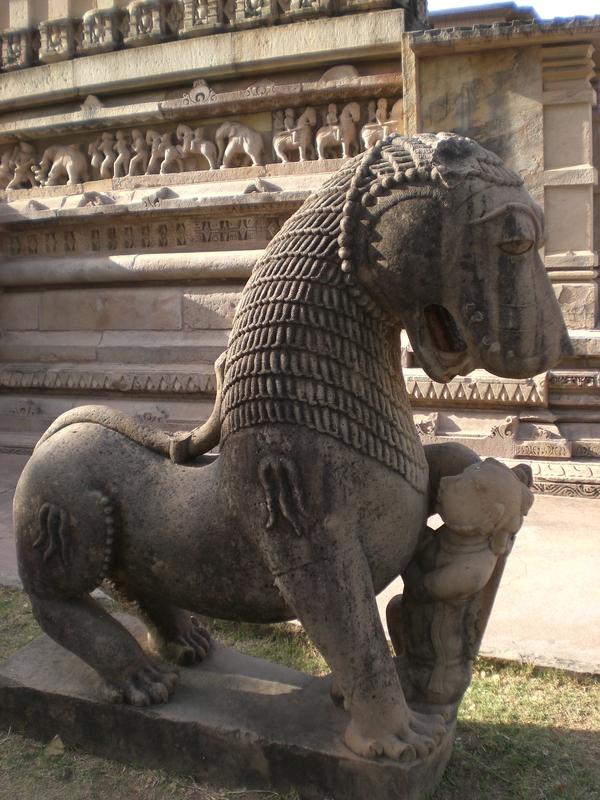 We wanted to remember this place and what is represented so we took home a small stone carving similar to the one below. I felt it symbolized my husband and myself and our deep love for each other sealed with an embrace. Thank you for reposting! Glad you liked it!